What is the ISNONTEXT Function? 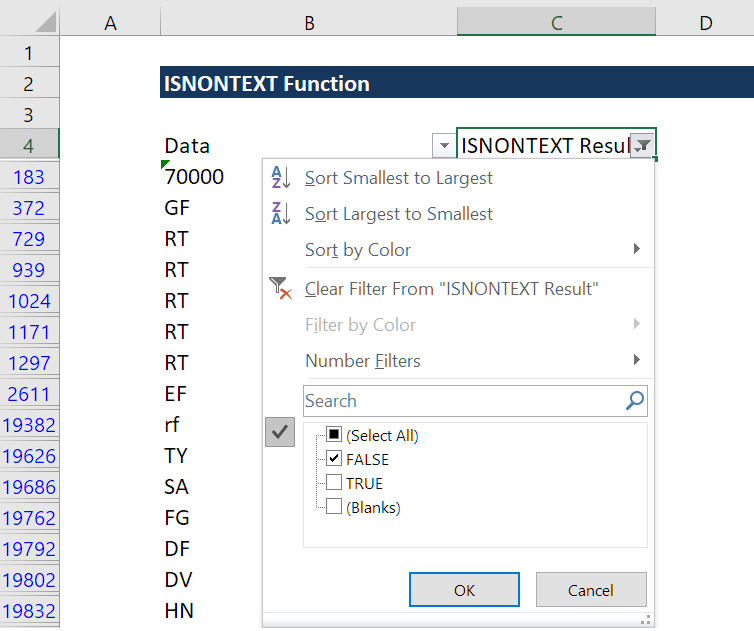 The ISNONTEXT Function is categorized under Information functionsFunctionsList of the most important Excel functions for financial analysts. This cheat sheet covers 100s of functions that are critical to know as an Excel analyst. The function helps to check if a cell contains text or not (is anything typed into a cell?). It will return TRUE if the value is text and if not, a FALSE value. For example, if the given value is a number, date, or time, ISNONTEXT will return a FALSE. As a financial analystFinancial Analyst Job DescriptionSee a real Financial Analyst Job Description including all the skills, experience, and education required to be the successful candidate for the job. Perform financial forecasting, reporting, and operational metrics tracking, analyze financial data, create financial models, when dealing with large amounts of data, the function helps in testing if a given value is a text or not. It is also useful in some scenarios. For example, you performed AUTOSUM for a large amount of data. When the result gives you an error, we can check if there is text in between (or not). The ISNONTEXT function will return a logical value, which is TRUE or FALSE. 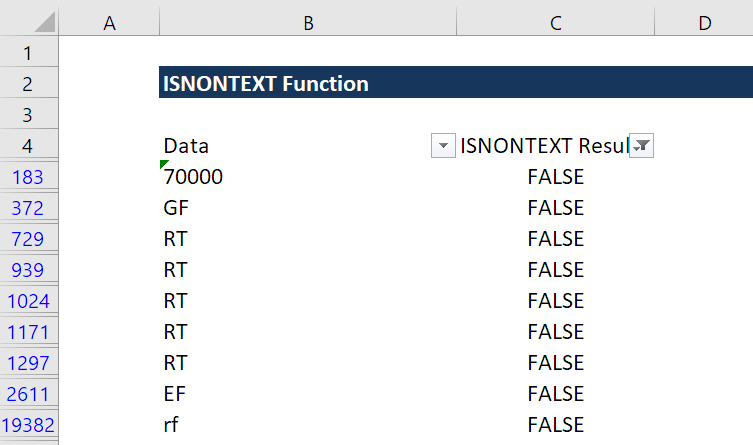 How to use the ISNONTEXT Function in Excel? TRUE =ISNONTEXT(TRUE) FALSE The value is a text, so the function returned FALSE. =ISNONTEXT( ) TRUE The function returned TRUE for blank values. “CFA” =ISNONTEXT(“CFA”) TRUE Although the expression is text as it was in inverted commas, the function returned TRUE. #NAME? =ISNONTEXT(#NAME?) TRUE The function returned TRUE for formula errors. 32.00 =ISNONTEXT(32) TRUE The function returned TRUE as it is a number. First, the number of rows filled with data is 20,529, whereas the data imported should show 20,500 rows filled. While going through the data, we realized that there are few rows that contain text. First, we need to remove the rows that contain text. To do it, we can use ISNONTEXT formula (to see is anything typed into a cell). Now we will drag the formula until the end to cover all rows. After selecting the filters, we can click on the downward arrow and click only on FALSE to get rows with FALSE on them. Now we see the culprits, which are the rows that contain text. We can now delete them and crosscheck with the original data. Here, there are 26 rows with text, meaning one row was imported as text. We can even correct the error and format it to a number. The ISNONTEXT function is part of IS functions that return the logical values TRUE or FALSE. It doesn’t return an error such as #NAME!, #N/A!, etc., as it just evaluates data. We can determine, is anything typed into a cell?